Cell phones have become an integral part of our lives ever since they came onto the scene. There is hardly anyone on the planet who doesn’t use a cell phone every day of his or her life. The term cell phone is so apt since most of us are prisoners to our phones from the rising of the sun to the time we retire for the day and even going to bed with our phones placed very closely to our heads. Our phones have become an inseparable part of our lives and going by the latest happenings in our world today, it looks like these mobile devices are here to stay forever. In the past, phones were usually limited to the lengths of their cord and were usually fixed onto the clinic or hospital walls, or placed onto consulting tables and usually they were answered by the support staff. If the call was urgent, it was transferred to the dental surgeon. In stark contrast, in today’s world we carry our cell phones everywhere we go, they have become our faithful companions all through the day. It doesn’t matter if we visit the gym and place them on gym mats while working out or while using the restroom we place them on the sink while washing our hands, many times we drop them on floors, and we keep sharing our phones to show our friends and families the pictures on them. Every time we do these things, we are exposing ourselves and everyone around us to serious health hazard. It has been noted that our cell phones harbour more bacteria than our toilet seats! The reason being, that even toilet seats are cleaned periodically and sanitized every now and then. In contrast, we never take the time to disinfect our cell phones. And there lies the problem. Today cell phones are becoming a very dangerous tool in our hands as they are covered with bacteria that we keep transmitting when treat patients, when we shake hands, and do almost anything since cell phones are always with us. Let us discuss the problem with respect to dental clinics and dental hospitals in an everyday scenario. A common occurrence at dental clinics is that many patients are continuously talking on their phones. They enter the operatory still talking, get into the dentist’s chair, now at the same time the dentist may be talking on his phone, the assistant talking on her phone and all of them proceed to start the dental treatment, sometimes without even hand washing. As a result of various factors like the proximity of the dentist to the patient and the transfer of bodily fluids like blood and saliva from the patient’s mouth to the dentist’s gloves, contamination occurs. Unfortunately for us, the humidity and temperature of our gloved fingers, as well as the heat generated by our smartphones greatly aid in the multiplication of bacteria. Thus, all surfaces of the smartphones are laden with bacteria. It is important to note that many smartphone users keep their phones in covers which again help bacteria to multiply at alarming rates and this is something we don’t realise. The same phones that are laden with bacteria are then used by us in proximity to our ears, mouth, and hands – thus starting the spread of infection. This problem has been around for a long time but the awareness has only just begun. Statistical analysis in many parts of the world reveal that these microorganisms like methicillin-resistant staphylococcus aureus, CONS bacillus, diphtheroids, methicillin susceptible staphylococcus aureus, E.Coli, viridans streptococci, micrococci, klebsiella pneumoniae, and ESBL Klebsiella pneumoniae et al. are lethal in nature. These problems are present at both clinics and hospitals. Thus, contributing to nosocomial transmission of microorganisms. These smartphones used in proximity to patients who are admitted to such hospitals and who are already vulnerable to infections, thus resulting in nosocomial infections. Awareness About HH [Hand Hygiene]: There needs to be an aggressive campaign in the whole medical and dental fraternity regarding hand hygiene after which come what may smart phones must not be touched. Use of microbicidal hand rubs like Hexiprep-T to disinfect hands before operating on a patient. To use, take sufficient quantity of undiluted Hexiprep-T, and gently rub it on dry hands, fingernails, and all surfaces till it dries. 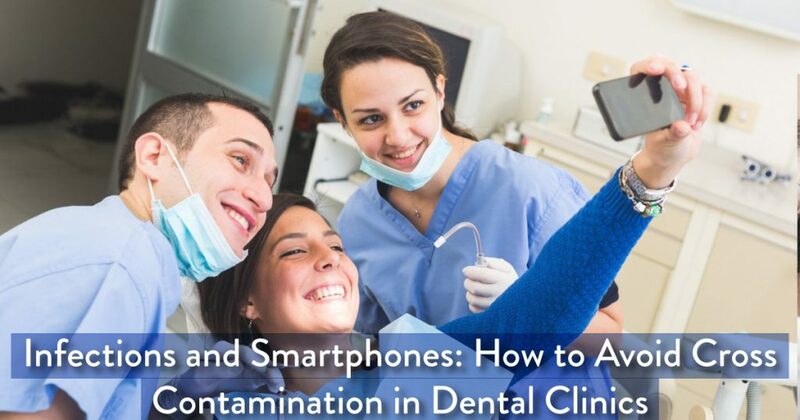 Patients must not be allowed to get their smartphones at least in side dental operatories. All HCW’s must store their phones in a non-patient area and avoid using them whilst working. There must be non-clinical support staff to handle such calls or emails and these should be relegated to a certain part of the working day to minimise cross contamination. An alcohol swab must be used on the surface of smartphones. If not every day, then at least 2-3 times a week. Carrying cell phones while using the facilities must be stopped at once. With these tips, you can avoid nosocomial transmissions in your clinic.